The RUST server name is a RUST server setting that can be configured and modified by server owners and admins. Its primary purpose is for server owners to name, label or title their RUST server, while limited to 60-70 characters in length. Server name’s are the very first thing players will see when selecting a server to play on. Because of this, the server name must be carefully crafted. The server name is actually indexed so that it can be searched in the server browser. 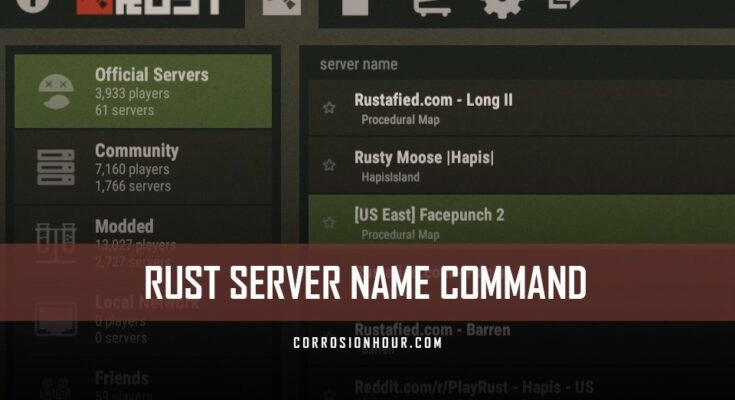 Players will use the search tool to narrow down RUST server names that contain their specific search queries. This is the second level of filtering servers. The first level of filtering begins with the categorical selection. Players must first choose a category of servers, which defaults to Official. There are three other selections available: Community, Modded or Local Servers. Players will make snap decisions based solely on a RUST server’s name, so take advantage of this fact. This is followed by the server’s population. If the name is not appealing and informative, its chances of being clicked on are low. With the limited character space, it’s important to focus. Be sure to include the actual server name or title and then focus on the top 3 features of the server. Compliment the server name by also setting up a RUST server header image and a strong RUST server description. Getting players to double click on a server name is really the main objective of the server name and description. This is aided by having a strong understanding of how these server properties work together to tell the story of your server. Remember, first impressions are critical. A RUST server name that is well fashioned can be the difference between someone scrolling past it or never having found it in a search. Utilize the allotted space in the server name. Aim to provide information that RUST players are looking for and most importantly align with your server type. Think of it as an elevator pitch for your RUST server. Make it enticing for potential players to click on. For instance, you can use just-wiped.net to see some quality examples. The RUST server name is a command and server variable that can be set in a startup file, configuration file or issued through a command line console by RUST server admins and moderators. 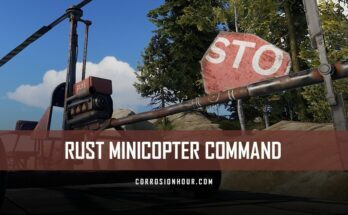 Non-admin players do not have access or the ability to set, edit, or remove a RUST server name. There are two primary methods for setting, editing or removing the RUST server name. Each method has it’s own pros and cons. Enter the server name command, listed below, into the server console, in-game console, or RCON console. Using this method, any changes to the server name will take effect immediately. Keep in mind, this method is temporary. The server configuration file is not overwritten, so if the server restarts it will be lost. Add the variable -server.hostname "" into the server’s configuration file. Using this method, the server name will be updated upon the server restarting. This command is used to set and modify a custom RUST server name. There’s no default server name value provided for Vanilla servers. 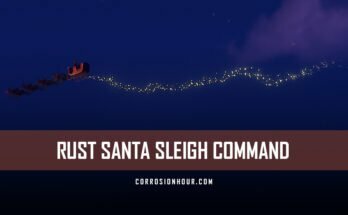 server.hostname: "[US West] Corrosion Hour | No Decay | Wiped: 5/4"
*Note that a server without a name/hostname set will not appear in the server browser screen. Also, if the image appears blurry, change your RUST graphic settings. This will have an impact.